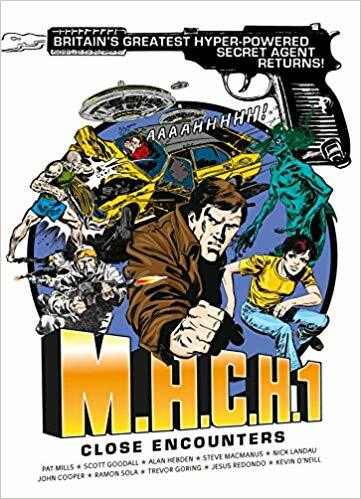 Originally published in 1977 and capitalizing on the popularity of a particular T.V series of the time The Six Million Dollar Man, M.A.C.H.1, which obviously stands for Man Activated by Compu-puncture Hyperpower, ran from the first issue of 2000AD in 1977 through until issue 64 in 1978. Volume two of the series picks up the story as it reaches its explosive conclusion. The sheer depth of the plot is something to behold as we are led through the life of a man, whose entire being is a battle against being controlled at every turn. Like a cyber James Bond, the fantastically named John Probe, an enhanced human being who has been given what’s known as “hyper power”, is called into action by the British Secret Service once again, to face off against terrorist threats, be they alien or otherwise. But the cracks are starting to show and Probe soon finds himself distrusting the motives of his creators as well as fighting a literal war inside his head, as the chips in his brain continually overrule his natural instincts. Discovering a failed prototype M.A.C.H.0, who himself gets a spin off story here, only deepens his mistrust and his creator Denis Sharpe, which fuels his determination to expose the service and their dark agenda.